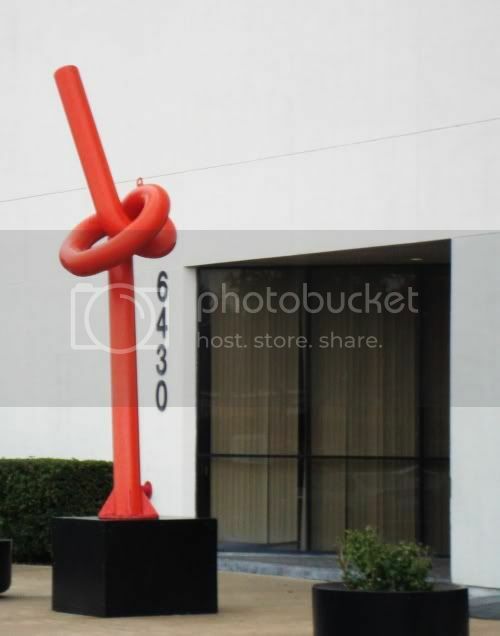 One of the most common ways that people experience art in Houston (and probably many other places) is that they see large, usually abstract sculptures on the grounds of office buildings. Cousins to public art (aka plop art), I call this art "corporate plop." I think it has three basic purposes. First, it's there to "class up the place." Related to that is that is is designed to show that the owner is wealthy and powerful. Finally (and most practical), it makes a useful landmark--something that people will remember about the building. It is a branding device. 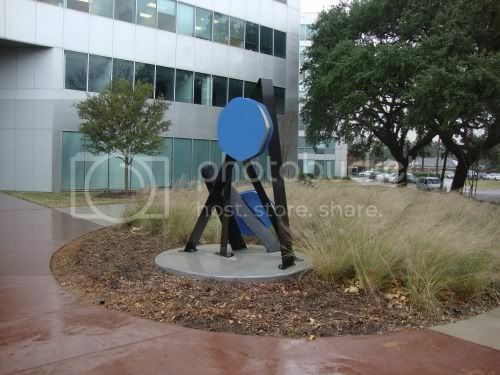 For instance, this piece in front of the ABB building on West Sam Houston Parkway between Richmond and Westpark. As landmarks, they aren't so great because they are rather small--and there is way too much visual clutter on Richmond for them to stand out. (That said, I've noticed the red one for years, so maybe it would work as a landmark.) I'm guessing these were placed here by the owner of the buildings, and if so, I assume their purpose is, in part, to signal to prospective tenants that these are classy locations for offices. (Demonstrating the classiness of these offices, given their location, must be a truly quixotic task.) But their small size and general lameness prevents them, I think, from serving as signs of the building owner's wealth or taste. 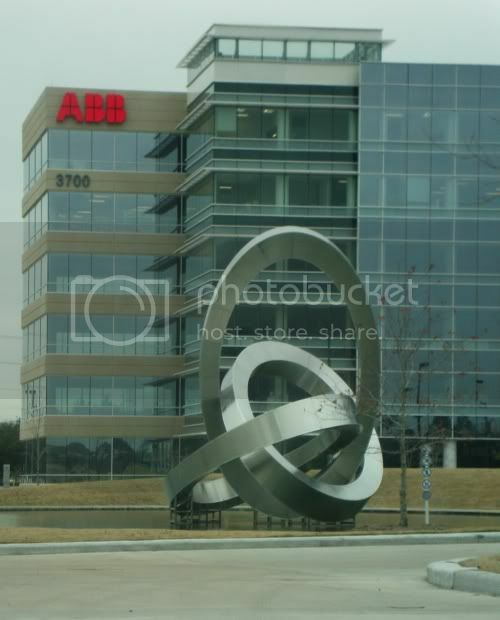 And while I didn't like the ABB ellipses as art, I can see that they have a conceptual relationship with ABB's core mission, as I mention above. I don't see any similar relvance for these two sculptures. So as corporate plop, I give these two failing marks. 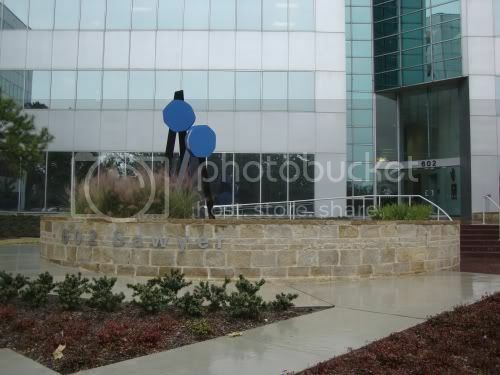 One of the most interesting but controversial examples of corporate plop is at 602 Sawyer, just north of Memorial Dr. This is a building with multiple tenants, and it is owned by Grubb & Ellis, a national commercial real estate firm. I'll get to the controversy later. Let's look at the sculpture first. This is in the front of the building. 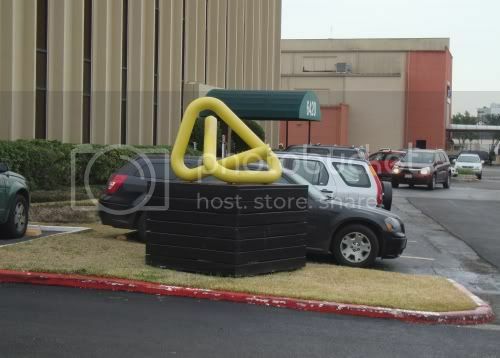 Then in the back entryway (the one most people use, because it's where the parking is), we have a similar piece. Along the side is this piece of alien cursive. Similar examples of unearthly typography are hung on the back of the parking garage. But wait--there's more to this story. These sculptures turn out to be by an artist named George Sugarman. Specifically, they were all part of a single large sculpture, the "St. Paul Commission." This was a hanging vertical sculpture in the lobby of the First National Bank of St. Paul. 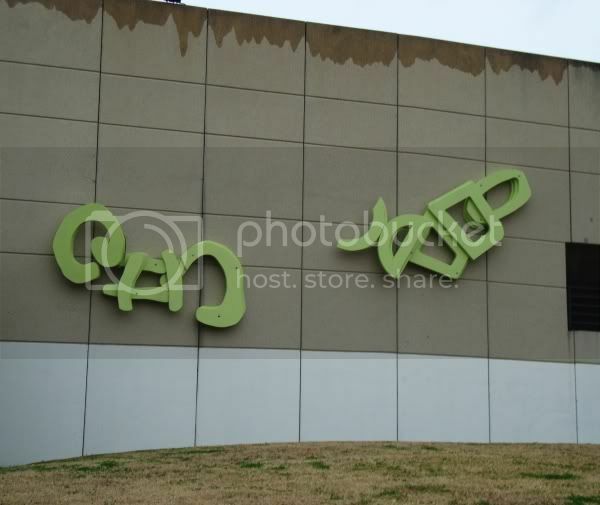 But when that building was sold (along with the sculpture), the new owner didn't want it the piece. 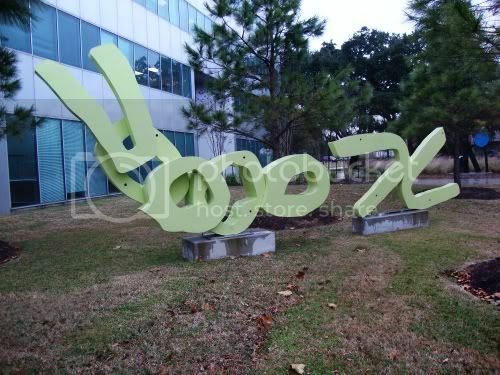 They sold it to Grubb & Ellis, which used pieces on various properties in Houston and Austin (there's another piece of the work upin the Woodlands somewhere). So this is a weird situation--the piece has been rescued but dismembered (like so many pieces of ancient art that ended up in the loving hands of European museums). When Ross Crowe, a Grubb & Ellis senior vice president, heard about the sculpture’s availability, he recognized Sugarman’s name because he’d seen the artist’s work at the Jack S. Blanton Museum of Art in Austin. Acquiring, restoring the sculpture and installing its components — a total of 19 installations — at various Houston and Austin properties fit into Grubb & Ellis’ efforts to improve its curb appeal and project "a high-caliber image," he said. Naturally, this caused a certain amount of anguish among Sugarman fans and family. Arden Sugarman, director and president of the Novato, Calif.-based George Sugarman Foundation, said she wishes Crowe had discussed his plans with her. She first learned of the sculpture’s dismantling when Mark K. Thompson, a St. Paul attorney and blogger, e-mailed her. "I had always loved the sculpture (it’s right across the street from where I go outside to smoke cigarettes), but I really didn’t know anything about it," Thompson wrote on markkthompson.blogspot.com about two weeks after seeing construction crews dismantle the artwork. Arden Sugarman and Thompson weren’t the only ones who were shocked. Attorneys for Public Art Saint Paul had drafted a agreement with building representatives for title transfer and permission to remove and store the sculpture "pending restoration and identification of a new site" in St. Paul, the fall 2008 issue of the group’s newsletter reported. I don't have a strong opinion about this. It's too bad it was disassembled, but at least it was saved from the scrap heap. And I have to say that the individual parts are quite delightful. But this is not the last word on corporate plop. In fact, I intend to document interesting examples--good or bad--whenever I can. But there is a special category of corporate plop that deserves its own post, and as soon as I can get a good photo of the example I have in mind, I will share it here.